The upturned vehicle on Pratt Lane, Mirfield. A car was upturned when a motorist mistook his accelerator for his brake, witnesses have said. 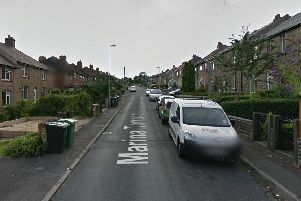 Pratt Lane in Mirfield was closed for several hours this morning (Monday), while emergency services resolved the situation. A police officer tends to the scene. The driver, reportedly an elderly gentleman, left the vehicle unhurt but was shaken up by the incident.